Since 2009, Nacogdoches.org has received an annual facelift from the A-Team. New design can be spotted on a wide variety of Nacogdoches County Chamber of Commerce communications, including the 2016 Official Guide & Chamber Directory, the 2016 City & County Street Map, member emails through the Chamber's Constant Contact communications, and Facebook. In memory of the late Francis 'Ab" Abernethy, SFA Professor emeritus, Renaissance man and a trailblazer in every sense of the word, the LaNana Creek Trail serves as the cover image and theme for the 2016 updates. Ab graduated from SFA in 1949 and returned in 1965 to teach, raising his five children to become Lumberjacks. In 1986 he began a decades-long quest to create the LaNana and Banita Creek trails, a task that began with Ab crawling through underbrush and hacking away with a machete at unruly patches of privet, laurel and hackberrry. Today residents and visitors enjoy exploring nature along miles of beautiful paths that wind through the heart of the town. Nacogdoches is a better place because of Ab, and his legacy will be enjoyed, and continue to inspire, for generations to come. How does the Nacogdoches Chamber of Commerce brand hold up to the annual redesigns? Each year, themes that incorporate the spirit of living, playing and working in Nacogdoches give the chamber an opportunity to build on their established brand by shining a light on the many sparkling facets of Nacogdoches County. Consistently applying the theme across the major communication tools the Nacogdoches County Chamber of Commerce uses to reach out to tens of thousands of members, prospects and visitors, enhances and extends this established brand. 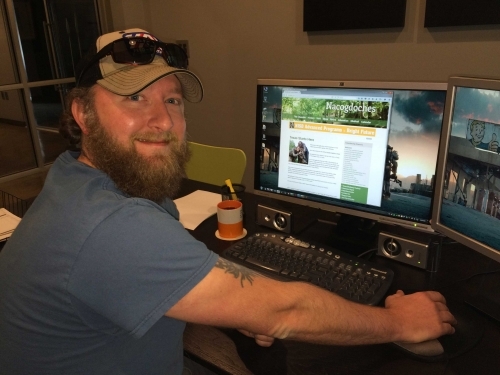 Pictured: Our very own Dana Britton worked to reprogram and redesign the new Nacogdoches.org to correspond with the Chamber's 2016 Operation Thank You event.